Eigg is an Island perched on the edge of the Celtic world. The islands to the west are the last land before the vast Atlantic sweeps out to the horizon and the mythic island of Tir na Nog, the lands of the Celtic otherworld. The Gaelic name for Eigg is ‘Eilean nam Ban Mora’, or ‘The Island of the Big Women‘. 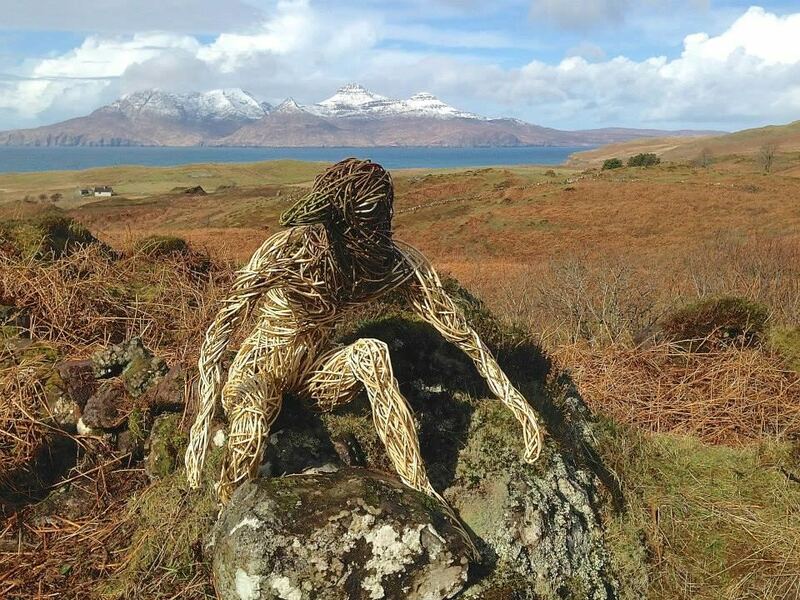 Eigg is steeped in legends of Big women – from the Amazon warriors of the Pictish Queen Moidart to a Sheella na gig carving. 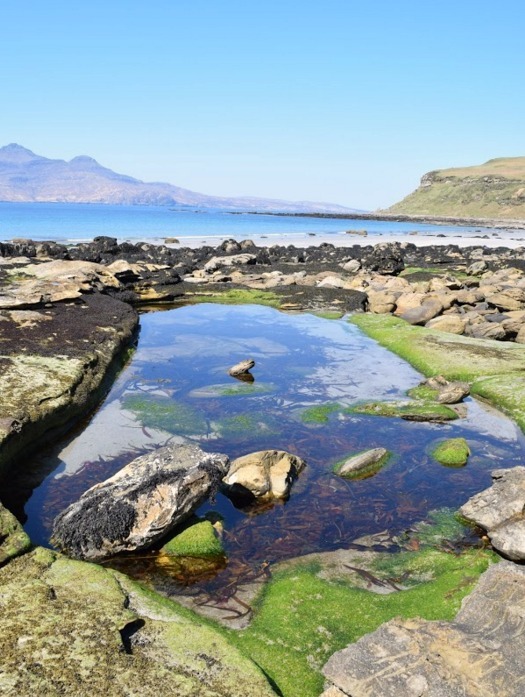 The body of Eigg holds stories of the great pre-Celtic Hag the Cailleach and on the retreat we will hear these stories and visit these sites in ritual and ceremony. Where is Eigg and How Do We Get There? The Isle of Eigg is 6 hours journey from Glasgow – but you won’t be doing it alone as you’ll be met in Glasgow Queen Street Station by a team member who will accompany you on your journey to the Isle of Eigg on one of the most spectacular train journeys in the world. The West Highland way takes you from the city of Glasgow right up to the west coast to Mallaig where you will get the ferry over to Eigg. 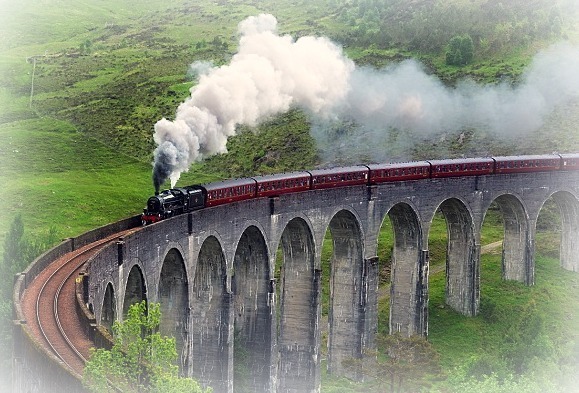 On the train journey you pass over the Glenfinnan Viaduct made even more famous from the featured Harry Potter films. The train ride is a wonderful reflection and chance to sit back let everything go as the train takes you onwards to your retreat through vast open stretches of moorland framed by tall towering mountains and the chance of spotting wild deer. You’ll also pass through Fort William which sits at the foot of the highest mountain in Scotland Ben Nevis. Then as the train arrives on the west coast you’ll see the sea and the outline of the Isle of Eigg and the Isle of Rum. It’s not uncommon to spot whales, dolphins and seabirds – even Killer Whales on the ferry ride. In May for hours after the sun goes down Eigg enjoys long magical twilight’s. Its in these magical hours that mountains which looked like rock and vegetation take on mythic forms. Imagine being on the land at twilight, seeing the first stars come out and then twilight’s paints everything with its magical and transformative touch. You can see the outlines of faces on ills and cliffs – which I like to call the Big Women. It’s in twilight, the gloaming, that people told stories and that the spirituality of these islands was born. It’s the magic and mystery of this time that brings you between the worlds – not quite day and not quite night. Not quite everyday reality and not quite the otherworld – a sacred place with a foot in each world. We will definitely be outside enjoying these twilights, down on the beach as we visit the Cailleach or gather around a rather special fire. Ishbel MacLeod (above photo) was one of Eigg’s best singers. 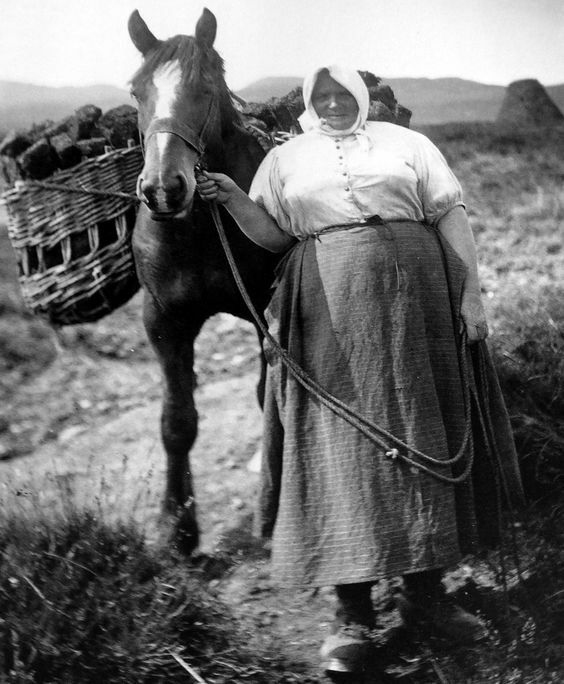 In this photo she is bringing home peat which is used to burn as a fuel. Eigg has a long history of singers, storytellers and pipers. I hope to have local author Camille Dressler give us a talk one evening on the women of Eigg as well as hosting a women’s singing group one evening where we can hear songs of the island but also join in! Eigg has a particular way of farming called crofting – which is only found in Scotland. It’s a form of small scale farming where locals grow their own food and raise hens, sheep and a few cattle. We’ll visit a working croft as well as visit a croft museum which will take you right back to the 1940’s! Hard to believe – but yes this is Scotland! Glorious beaches to explore with rock pools and beach combing. The tour launches on 17th August but if you can’t wait and want some insider information click below!